We have long been exploring new ways to create and generate Eco-friendly energy and replace fossil fuels. Some of the latest research has come across a novel way to produce electricity – bionic mushrooms! Research by the institute of technology has provided us with an insight into this slightly odd new way of producing electricity. 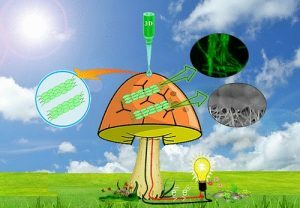 A group of scientists combined the mushrooms with 3 D printing using the theory of cyanobacteria and symbiosis whereby they attached these bacteria to a button mushroom and graphene nano-ribbons. The bacteria produce energy by turning sunlight into electric current, so producing bio-electricity. The bacteria used is commonly found in the sea and on land. So why mushrooms? Well the simple answer is these bacteria don’t live long enough in an artificial lab environment to be able to study them for any amount of time. The clever fungi are the perfect host! They have a perfect mix of moisture, nutrients, temperature and PH allowing the bacteria to stay alive longer. The scientists discovered that a small amount of power was produced – not enough to power anything alone but joined together, the mushrooms could potentially create enough energy to light an LED. The 3 D printing element comes in to help attach the bacteria to the surface of the mushroom. Bio ink containing cyanobacteria is put on the mushroom top in a winding example crossing with the ink at numerous contact focuses, enabling a great increase of energy to be produced. “It’s a new start; we call it engineered symbiosis. If we do more research in this, we can really push this field forward to have some type of effective green technology”. This is exciting news for green technology. As researchers scan for new ways to create green energy, there has been a sharp ascent in enthusiasm for cyanobacteria, and although more research is needed this is a promising start and could pave the way for other opportunities and research into bio-hybrid systems. These useful bacteria could play a growing part in the future of green energy. Could this be the perfect combination for eco-friendly electricity in the future? These scientists certainly hope that one day this process could shine a light on how to power everyday devices in an environmentally friendly way, as well as use it within other fields. Next PostNext What can each one of us do to slow down climate change?